Want to refresh your outfits? Add a flirty charm to them? 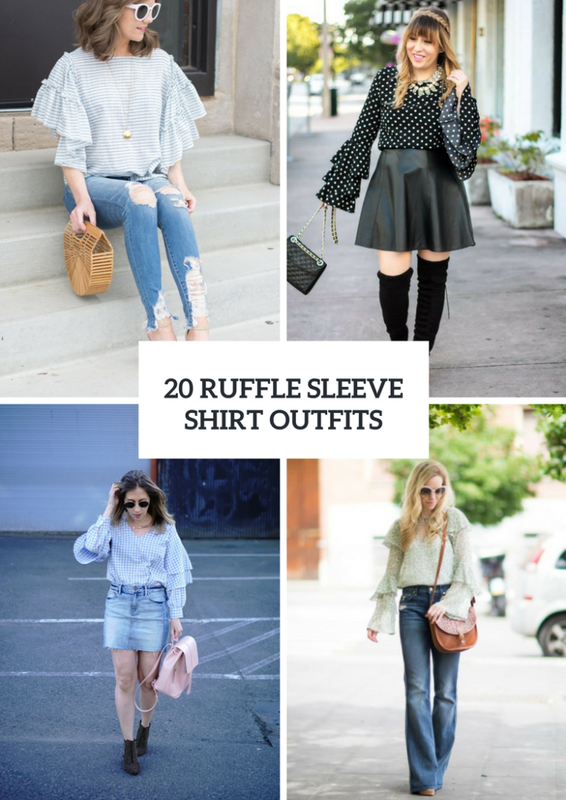 Then you need to pay your attention to pieces of clothes with ruffles, and today let’s talk about ruffle sleeve shirts. 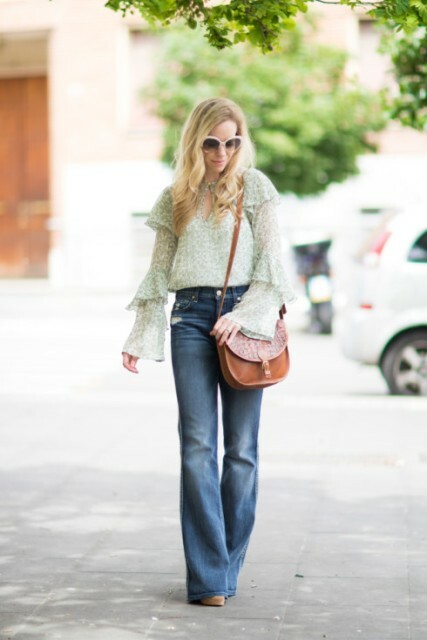 Depending on your style outfit you can choose a ruffle sleeve sweater, sweatshirt, airy blouse or t-shirt. 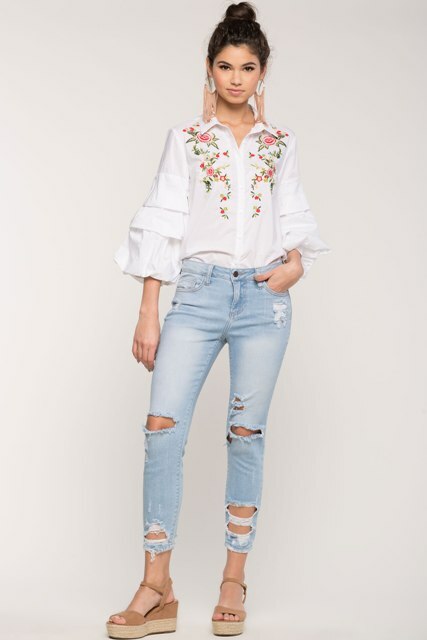 For example, to create an elegant and chic outfit you should take a monophonic button down shirt with ruffled sleeves, for party or event looks try to find a printed (striped, polka dot, etc.) 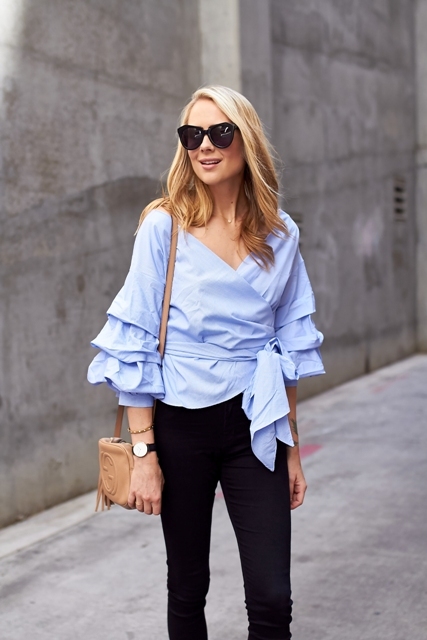 blouse and for casual outfits choose an oversized t-shirt with short ruffled sleeves. Now I offer you to scroll down to consider all ideas. Get inspired! 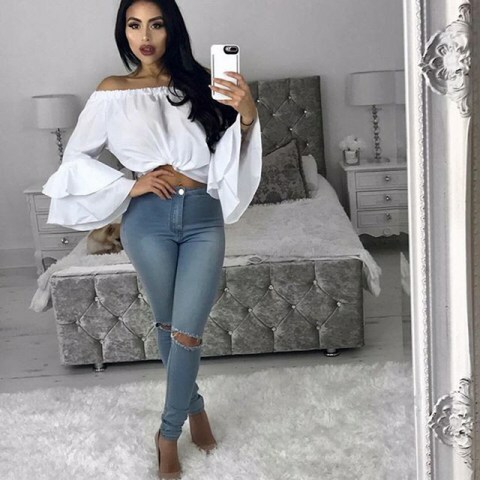 For spring casual outfits you can take distressed skinny jeans and combine them with a neutral colored or printed ruffle sleeve blouse, beige high heels and sunglasses. 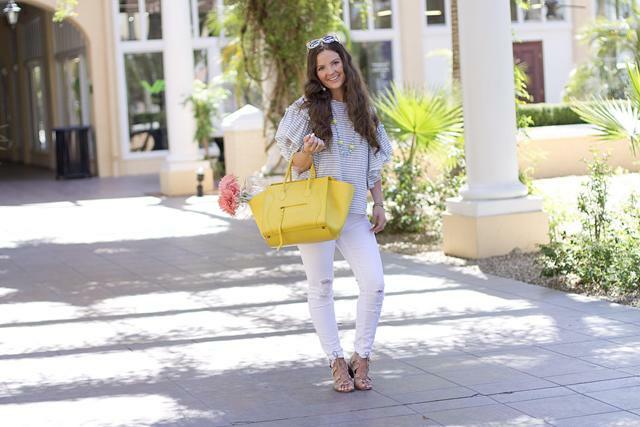 Or you can change jeans to white pants and add a bright colored tote (a yellow one, for example). For warmer spring days you can choose denim shorts and mix them with a polka dot oversized shirt and flat sandals. 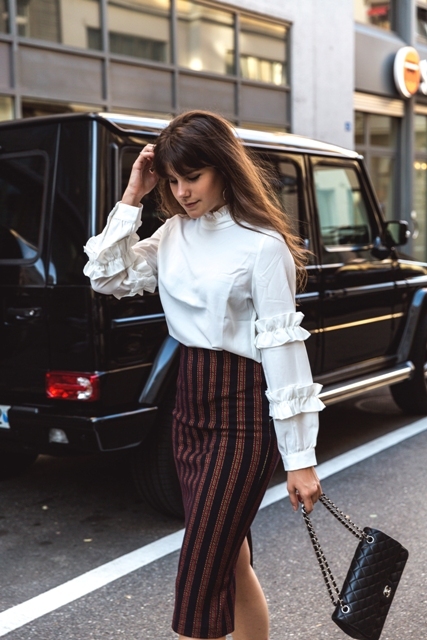 If you love black and white combinations, then pair a white blouse, black crop trousers (or change them to black leather skinny pants to get more fashionable look), black pumps and a black clutch. 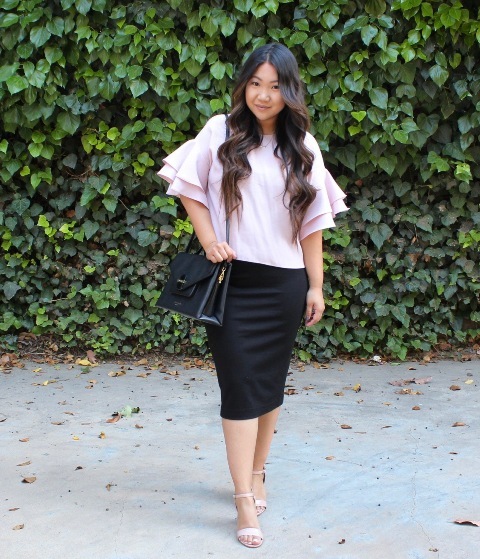 For an early spring you can mix a gray ruffle sleeve sweater with a white button down shirt, a silver metallic pleated midi skirt, printed shoes and sunglasses. It looks so adorable and trendy! For casual outfits choose a polka dot blouse and mix it with a black leather mini skirt, black suede over the knee boots, a black chain strap bag and a statement necklace. 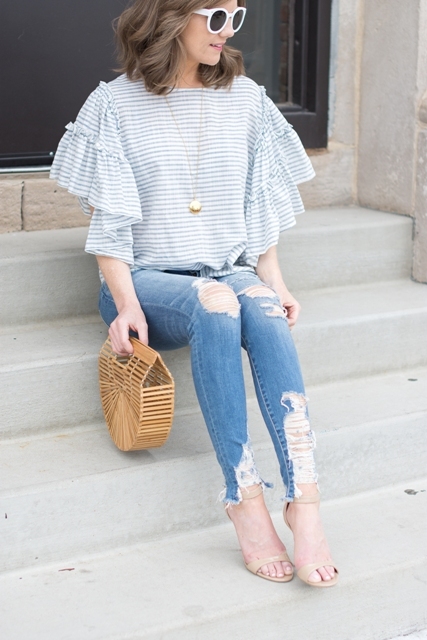 Or combine a white blouse with ruffle sleeves with a striped ruffle skirt, white lace up shoes and a black clutch.